You have big dreams for your little one! To help your daughter or son become a better gymnast, you're going to need to invest in some high-quality equipment. At Titan Fitness, we understand wanting the best for your children, which is why we made this sturdy kip bar. 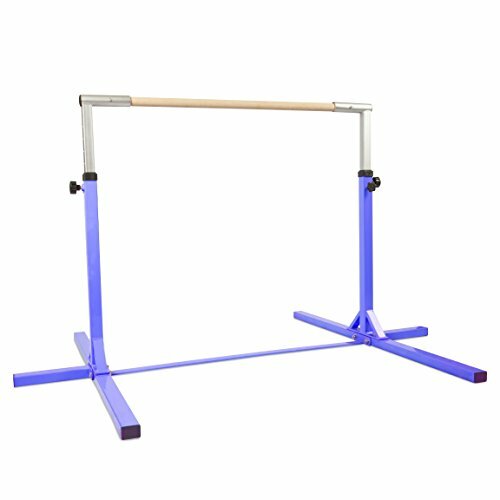 This dismounting bar is great for performing kips and other gymnastics stunts. In no time, your child will be a star gymnast! This pullover bar is conveniently adjustable, so you can set it to your child's height and frame. It works for children of various ages, including toddlers and many grade schoolers. The bar adjusts from 36" to 56"; just use the simple pop-pin design to adjust the height. The bar has a diameter of 1.375", weighs about 40 lbs., and can support a weight capacity of 125 lbs. It has a footprint of 54" x 72", allowing you to easily place a pad underneath it for safety. To prevent injury, you should place a 4-inch to 6-inch mat on top of the raised center bar. This system has rounded corners to also keep your little gymnast safe while training. This kip bar system has a heavy-gauge steel tubing frame, which lends itself to greater stability and sturdiness. On the bottom of the system, you'll find rubber floor pads that keep the bar from slipping and sliding during use. The bar itself is made from high-quality white ash wood, so your child can have a firm grip as they perform different exercises. This bar makes it easy to train from the comfort of your own home, so your child can practice whenever is most convenient for you and your family. Add this fantastic piece of equipment to your home gym today! 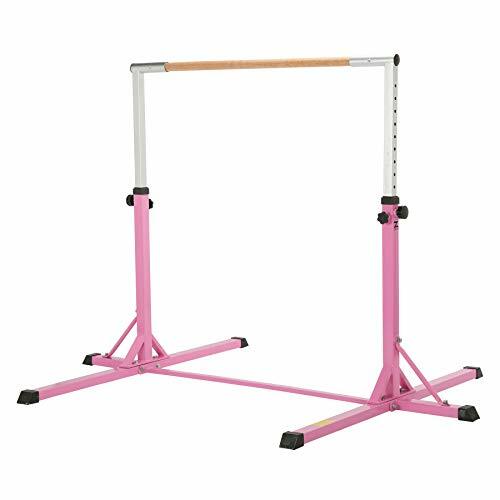 - Footprint: 54" x 72"
- Bar Diameter: 1 3/8"
- Height: Adjustable from 36" - 56"
IDEAL FOR GYMNASTICS TRAINING: Gymnastics is a serious sport that requires a lot of hard work and dedication. Those who are determined to be the best put in hours of training and effort to perfect their skills. Now you can train from home with the Titan Fitness Adjustable Jr. Kip Bar. You'll get plenty of exercise and training with this gymnastics gear. GREAT FOR KIDS: Many gymnasts start training while they're young - that means lots of driving back and forth to go to practices. With our horizontal bar, you can easily train from home! This bar is made for kids, so it can accommodate your little one's small size. But because it's adjustable, it can grow with your child. This bar is ideal for toddlers, preschoolers, and young children. DIMENSIONS: This bar has an adjustable height that ranges from 36 to 56 and a diameter of 1.375, making it a great size for younger boys and girls. This kip bar weighs about 40 lbs. and can support up to 125 lbs. It has a footprint of 54 x 72, so you can easily place a pad underneath it. We recommend placing 4 to 6 of matting on top of the center bar to prevent injury. EASY ASSEMBLY: One of the perks that this kip bar offers is the fact that it's conveniently portable. It can be assembled in minutes, so you can set it up wherever you need to. Conversely, it can also be disassembled for storage. Put it in your garage or shed while it's not in use. The kip bar comes with rubber floor pads to keep it stable and to prevent it from sliding during momentum exercises. STURDY MATERIAL: At Titan Fitness, we invest in only the most superior of products. Our high-quality fitness gear ensures that you are kept safe while you exercise. This kip bar is no exception! It's made from first-rate white ash wood, giving you a firm grip as you exercise. This kip bar system also features a heavy-gauge steel tubing frame, so it will withstand years of use. 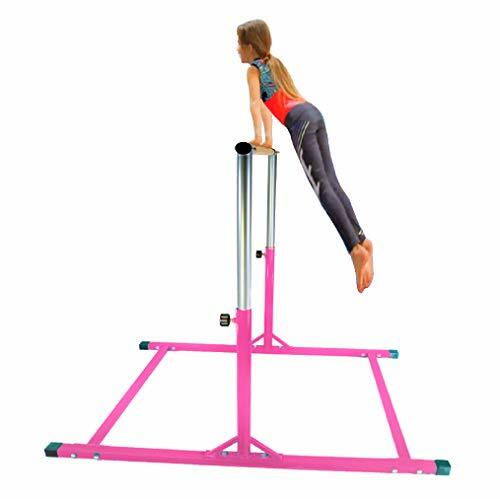 Tepemccu Folding gymnastics bar features an easy to fold and adjust height design, and it will be a perfect gift for beginner gymnast aged 3-8-year-old. Our gymnastics bar is well built and made of high-quality materials to ensure the stability and safety of the whole structure. SAFE & STURDY: Tepemcu Folding gymnastics bar are designed based on the triangle structure which ensures the stability of the whole structure. Two round pedestals and four slip-resistant rubber floor ring increase friction and absorb shocks when your kids are doing exercise on it. The excellent grip to the floor minimizes wobbly and make sure gymnastic bar stay in place safely. Moreover, protect your floor from scratching. FOLDABLE: This kip bar can be easily folded up to save space. Just pull up the connecting rods on both sides and finish fold in seconds. This gymnastic equipment will be a fantastic gift for Birthday, Halloween, Thanksgiving Day, and Christmas and so on. HEIGHT ADJUSTABLE: The folding gymnastics bar can grow up with your kids and is a long-lasting use product for your kid. There are 5 adjustable heights from: 34.8''/39.2''/42.3''/46.8''/50.8''. The specially-designed folding mechanism works so smooth that your little one can pull it out and change gymnastic bar height easily by themselves. PREMIUM QUALITY: Made of high-quality steel and coated with powder finish to prevent paint chipping off or rusting. This horizontal bar can hold up to 140 ILB and ideal for the use of 3-8 year old. This folding gymnastics bar will fit any 3 feet wide mat. GUARANTEE: The gymnastic equipment is backed with 1 Year guarantee and free replacement of after-sale parts. Money back guarantees without asking you questions if you do not like it. No risk to have a try! ZELUS Gymnastics Equipment for Home - Height Adjustable(3'-5') Gymnastics Bar for Home for Kids with Added Stability, Premium Gymnastics Beam with Load Capacity 220 Lb. Compared with our counterparts, this Gymnastics Training Bar put the safety of children and teenagers on the top of its list. The designers add an extra beam at the feet of the bar to a triangular structure to considerably improve its stability. The horizontal bar made of hardback Chinese beech wood adds to its durability and attractiveness. STEEL CONSTRUCTION FOR DURABILITY Materials decide quality, our Gymnastic training bar features solid steel construction finished in powder coating for superior anti-corrosion performance and long-lasting durability (220 lb. load capacity), 100% beechwood bar for ultimate comfort. PROFESSIONAL GRADE SAFETY FEATURES Unlike the competition, our gymnastics kip bar stays stable without shaking, our gym training bar features 6 base points that are wrapped with industrial grade rubber cap and the stable triangular structure is further enhanced by the premium materials to guarantee users' safety so they can enjoy themselves to the fullest. ADJUSTABLE HEIGHT WITH DUAL LOCK From 25.4'' to 59'' with 13 LEVELS, makes it perfect for users of any age and height while the dual lock system safeguards your kids for 100% security. Is perfect for young gymnasts as it can be adjusted to their height as they grow. MINIMAL ASSEMBLY Our professional grade gymnastics equipment is super easy to assemble and operate, compatible with floor mat of 47.2'' in width (NOT included) you can set it up in minutes regardless if you want to use it at home or in the gymnastics arena. TONS OF BENEFITS It's easy, it's fun, it's for everyone and it really works your body at the level of intensity you desire, it unites elements of gymnastics, compound bodyweight exercises, calisthenics, strength training, army boot camp, get healthy now. Bring gymnastics practice to your home!, Xtek horizontal bar will be delivered to your door and give you the ability to practice anytime. 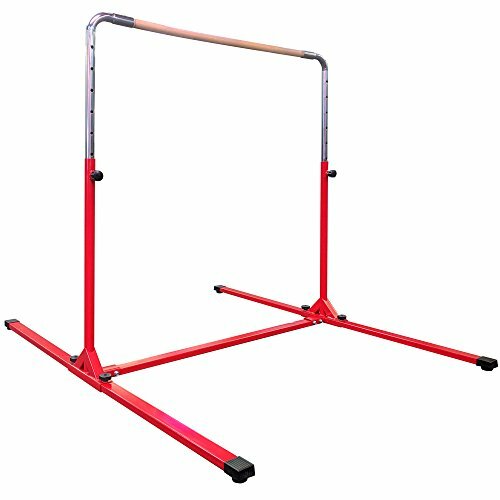 This bar is ideal for beginner to intermediate gymnasts that can have equipment that will grow with them over time. No longer does your child need to wait for their gymnastics class to practice. This jr kip bar is perfect for children, toddler, kids, and teens starting their gymnastics training journey and is adjustable from 3 - 5 feet. If your looking for the complete package goes great with one of our gymnastics beams. 6 or 10 feet beams are available. Kip bar is intended for indoor use on a flat surface. We recommend using a 2-6 inch mat for padding and stability. Mat should be 4 feet wide and we recommend using gymnastics hand grips as well with chalk. ADD to cart now for your amazing gymnastics bar while stock is still available. 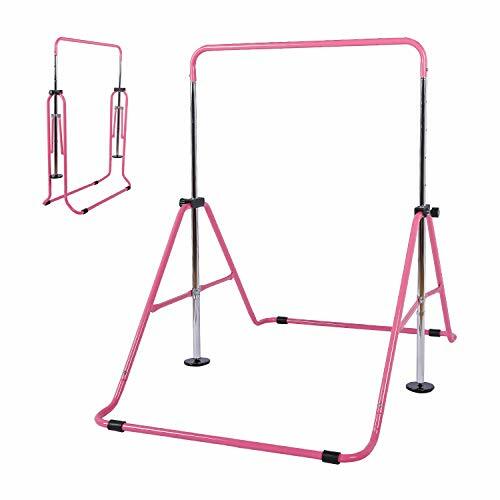 ADJUSTABLE HEIGHT GYMNASTIC BAR - As your kid grows so can their equipment! Expandable height from 3ft to 5ft high with secure locking knobs. This can be used for kids from toddler age to young adult. Great for boys and girls looking to practice and improve their skills. GYMNASTICS PRACTICE AT HOME - Have your gymnast be able to practice and improve their ability at the convenience of their home, becoming the best athlete they could be. Kids gymnastic bars for home are the best way to practice. ADDED STABILITY & RUBBER END CAPS - Our kids gymnastics equipment is meant for gymnasts up to 5.5 feet tall, weighing up to 140lbs. - Our kip bar is made from heavy gauge steel intended for kids under 140 lbs. Please use the kip bar with a 2 - 6 inches of matting. Premium rubber end caps hold the bar in place and also prevents any scratching on floors. 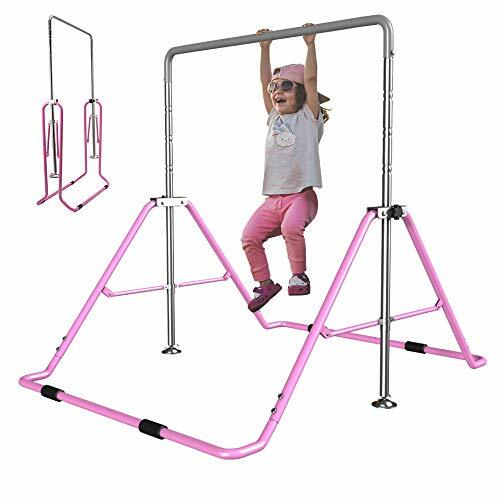 Top quality well packed Standard Size Kids Juniors and Adults Gymnastic Bar for all ages with durable safe construction double painted anti-rust bars, easy to adjust. easy to install within 10 minutes, weight 48 lb. This junior kip bar is an upgrade one, the base length is 180cm, which is 30cm longer than old design, and can make the kip bar more stable. The crossbar is made of premium beech wood, that will give you a better hand feeling. This kip bar is extendable to meet different height needs, great for strength training. Size: 78.8" x 70.9" x 35"-59"
ADJUSTABLE: The gymnastics bar can go as low as 35" and as high as 59", can meet different height demands. STABLE: Three square pipes and side support design at the bottom of the gymnastics bar to increase the stability. DURABLE: The kip bar is seamless welding, hard to break, very durable. COLOR-FIXING: The Junior kip bar is spraying in outdoor grade, no discoloration and no paint dropping. EASY ASSEMBLY: You can just set it up with a few screws in a short time, ideal for both home exercise and professional training. Adjustable Height: 2.8ft, 3.4ft, 3.8ft, 4.5ft. - SLSY 7x24-hour message reply (Mon-Sun). -SLSY 90-day money back and 12-month quality guarantee. - SLSY Hassle free replacement. Quality warranty is only valid with your purchase from SLSY. STURDY AND SAFE: Triangular structure make the gymnast bar more stability and safety. It's made of kids safe long lasting strong steel with a smooth powder coated finish to ensure quality and safety. 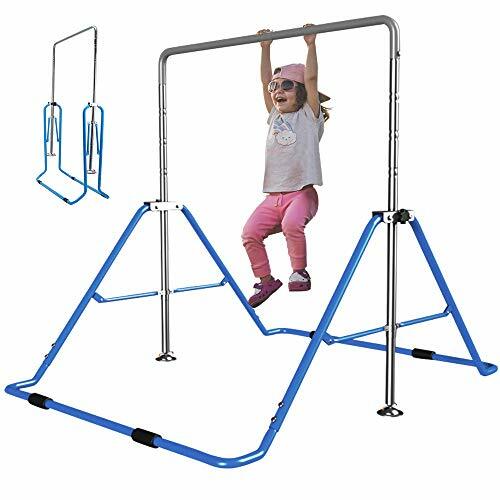 This horizontal bar fits 3-7 year old kids and can accommodate up to 130lbs. FOLDABLE & EASY ASSEMBLY: Kids gymnastics bar is foldable for easy storage, saving space and time. Just pull up the connecting rods on both sides of bar to finish fold in few seconds. 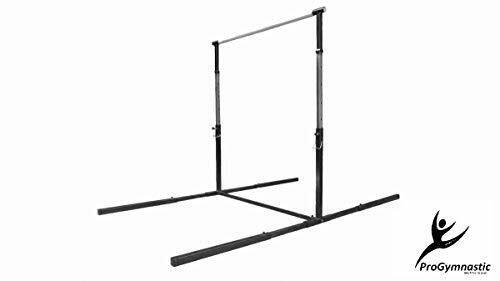 4 ADJUSTABLE HEIGHT: Slsy gymnastic training bar have 4 height to adjust: 2.8ft, 3.4ft, 3.8ft, 4.5ft. 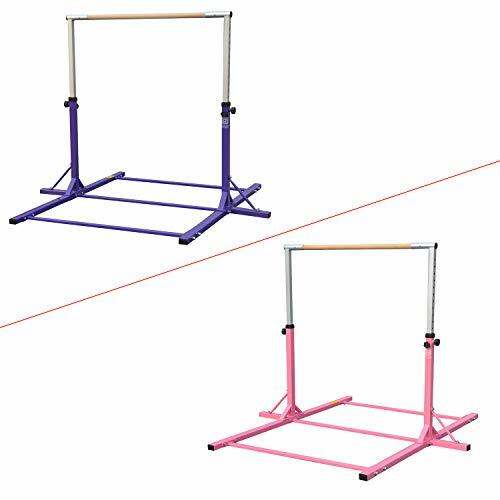 The kids gymnastic bars can be easily adjusted up or down in height. GREAT GIFT: Best gift for holidays, birthdays or festivals (Children's Day, Christmas, Halloween, Thanksgiving Day & New Years). The gymnastic training bars also can be attached with swing,climbing rope and ladder to add more fun! SATISFACTION GUARANTEE: 100% worry-free guarantee, 2-year manufacture guarantee for Slsy gymnastics bars! 30-day return & money back guarantee, we offer premium quality and the best service, no matter what reason cause dissatisfaction, we'll replace it or reimburse you every cent back! US Warehouse delivery Quickly order Quickly receive! STURDY AND SAFE: Triangular structure make the gymnast bar more stability and safety. It's made of kids safe long lasting strong steel with a smooth powder coated finish to ensure quality and safety. This horizontal bar fits 3-7 year old kids and can accommodate up to 130lbs. Suede Leather Upper - Ensures durability and support. Textile Lining - Allows for ample airflow. Cupsole - Increase structure and support. Medium Flex Midsole - Provides flexible comfort. 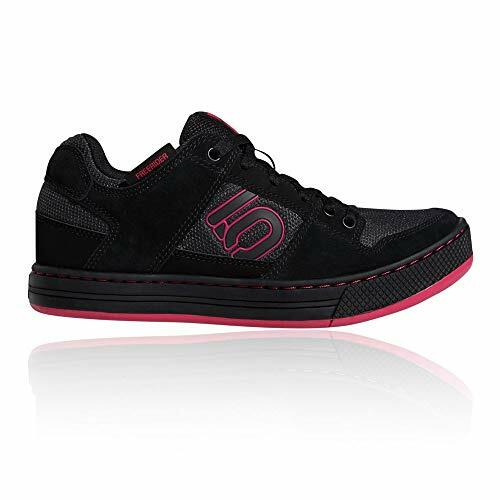 Removable Insole - Increases underfoot cushioning. Gymnastics Bars/Kip Bar 8 ft in Length- Plus You can Upgrade to an Uneven bar Gymnastics bar 8ft in Length Variable Height from 40"-60"
This is the only Gymnastic Bar that can go from a single Gymnastic bar to Uneven bar!